For the August 2012 Photo Assignment, TDS shooters hit the streets. See for yourself in our gallery, Street Scene. And which one will be the SizzlPix Pick of the Month? 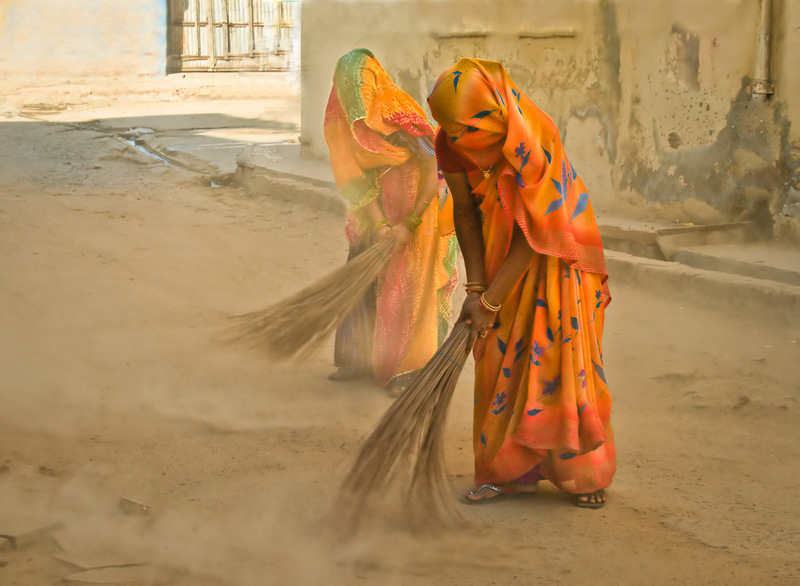 Untouchable women sweeping the streets of Mandawa, Rajasthan. "It was early in the morning and I was walking the streets of Mandawa, in the Indian state of Rajasthan," writes Sergio Burani. In a cloud of dust, these two untouchable women appeared from nowhere, sweeping with a short-handled broom. The bright colors of their costumes provided a sharp contrast with the misery of their task." See all of the great images from this month's assignment by visiting the Street Scene gallery page. The October 2012 assignment is "Panorama." Details can be found on the Member Participation page. Deadline is Oct. 31, 2012. Please follow the instructions carefully for labeling the subject line of the email for your submission. It's easy to lose these in the pile of mail if not labeled correctly. For example, the subject line for this month's assignment should be: "Photo Assignment: Oct 2012." Also, if you can, please don't strip out the metadata. And feel free to add any IPTC data you wish (These fields in particular: Caption, Credit, Copyright, Byline), I use that for the caption info. For the July 2012 Photo Assignment, TDS shooters tried to stay cool while capturing heat in their images. See for yourself in our gallery, Hot. And which one will be the SizzlPix Pick of the Month? Photo by Gerry Legere. 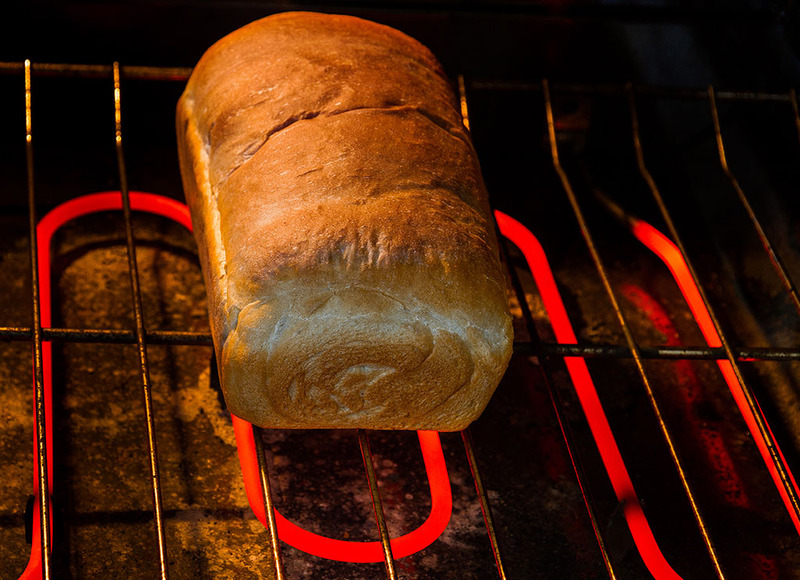 "Heat is important in the making of bread, so I thought I would try to show the bread and heating elements together, to convey the the cooking process," Gerry wrote. To see all of the other terrific shots from July, visit the Hot gallery page. The September 2012 assignment is "Bokeh." Details can be found on the Member Participation page. Deadline is Sept. 30, 2012. Please follow the instructions carefully for labeling the subject line of the email for your submission. It's easy to lose these in the pile of mail if not labeled correctly. For example, the subject line for this month's assignment should be: "Photo Assignment: Sept 2012." Also, if you can, please don't strip out the metadata. And feel free to add any IPTC data you wish (These fields in particular: Caption, Credit, Copyright, Byline), I use that for the caption info. Good luck with your Sept. assignment, and congratulations to all of the fine contributors for July. For the June 2012 Photo Assignment, TDS shooters found wisdom, humor, and direction in the words around them. See for yourself in our gallery, Signs. And which one will be the SizzlPix Pick of the Month? Photo by Gerry Legere. "After driving around town looking for ideas, I first spotted two spots which looked promising very close to each other," Gerry wrote. "But then, as a bonus, the photo I decided to include also had the word Signs. 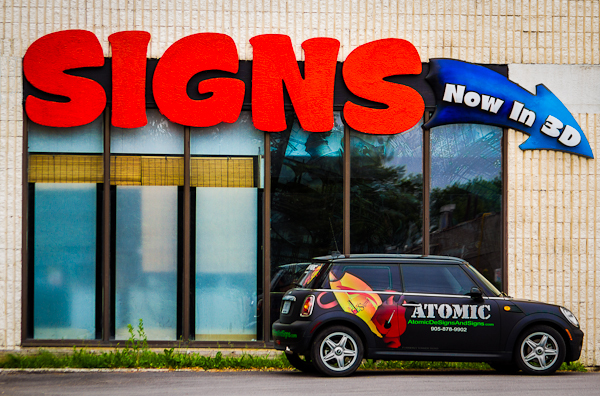 This image features great colors, and a car in front, which sported a sign on its side that helped to repeat the theme." To see all of the other terrific shots from Jume, visit the Signs gallery page. The August 2012 assignment is "Street Scene." Details can be found on the Member Participation page. Deadline is August 30, 2012. Please follow the instructions carefully for labeling the subject line of the email for your submission. It's easy to lose these in the pile of mail if not labeled correctly. For example, the subject line for this month's assignment should be: "Photo Assignment: August 2012." Also, if you can, please don't strip out the metadata. And feel free to add any IPTC data you wish (These fields in particular: Caption, Credit, Copyright, Byline), I use that for the caption info. Good luck with your August assignment, and congratulations to all of the fine contributors for June. For the May 2012 Photo Assignment, TDS shooters fired up their motor drives and captured the world moving around them. See for yourself in our gallery, Action. And which one will be the SizzlPix Pick of the Month? Photo by Ron Boyd. 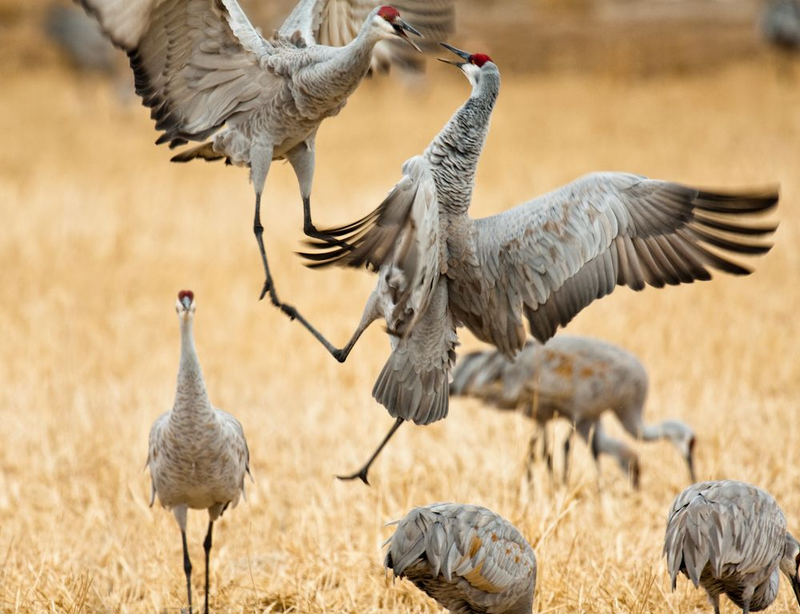 "When I heard the assignment 'action,' the first thing I thought about was this photo captured at Bosque Del Apache. I really like the contrast of the two engaged in intense competition while the other birds are seemingly unaware." To see all of the other terrific shots from May, visit the Action gallery page. The July 2012 assignment is "Hot." Details can be found on the Member Participation page. Deadline is July 31, 2012. Please follow the instructions carefully for labeling the subject line of the email for your submission. It's easy to lose these in the pile of mail if not labeled correctly. For example, the subject line for this month's assignment should be: "Photo Assignment: July 2012." Also, if you can, please don't strip out the metadata. And feel free to add any IPTC data you wish (These fields in particular: Caption, Credit, Copyright, Byline), I use that for the caption info. Congratulations to Brian Reynolds for his "Eyes" photograph, and to Ruth Cooper for "Macro." Each will receive a SizzlPix for his winning image, selected by the good folks at SizzlPix. For the April 2012 Photo Assignment, TDS shooters got "up close and personal" with their subjects. See for yourself how the world changes with a tight perspective in our gallery, Macro. And which one will be the SizzlPix Pick of the Month? Photo by Hamish Carpenter. "I recently purchased the Canon 100mm f2.8L Macro lens and this assignment gave me an excuse to get out and do some experimenting. For this photo, I set up a standard cheese grater on a table with a towel underneath and placed a colored gel on a speedlight to get this effect. Mild effects were added in Color Efex Pro4. I think it came out pretty well. I look forward to spending more time finding new objects to shoot with this lens - it is amazing!" To see all of the other terrific shots from April, visit the Macro gallery page. The June 2012 assignment is "Signs." Details can be found on the Member Participation page. Deadline is June 30, 2012. Please follow the instructions carefully for labeling the subject line of the email for your submission. It's easy to lose these in the pile of mail if not labeled correctly. For example, the subject line for this month's assignment should be: "Photo Assignment: June 2012." Also, if you can, please don't strip out the metadata. And feel free to add any IPTC data you wish (These fields in particular: Caption, Credit, Copyright, Byline), I use that for the caption info. For the March 2012 Photo Assignment, TDS shooters focused their lenses on the "windows of the soul"...or a twist on that concept. See for yourself in our gallery, Eyes. And which one will be the SizzlPix Pick of the Month? Photo by Brian Reynolds. 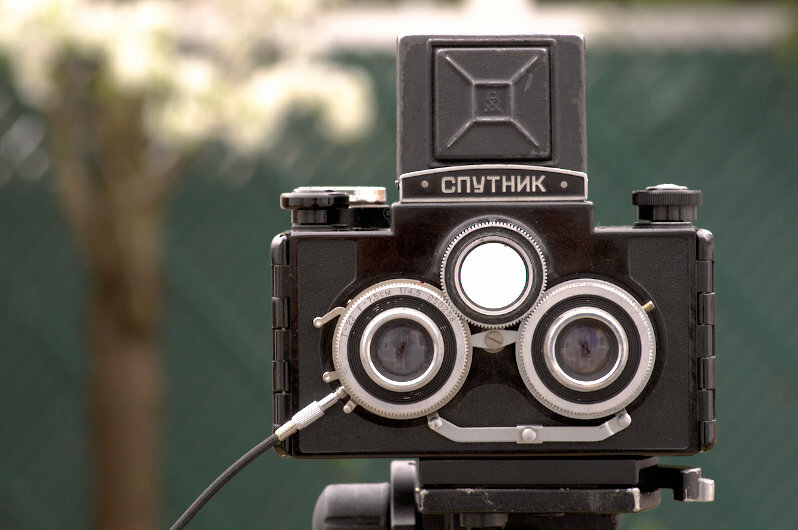 "This is the GOMZ/LOMO Sputnik that I use to make Medium Format stereo slides. This was taken with a Pentax K-5 and a smc PENTAX-D FA 100mm F2.8 Macro lens. It was processed with LightZone to adjust the exposure, color balance, and sharpness." To see all of the other terrific shots from March, visit the Eyes gallery page. The May 2012 assignment is "Action." Details can be found on the Member Participation page. Deadline is May 31, 2012. Please follow the instructions carefully for labeling the subject line of the email for your submission. It's easy to lose these in the pile of mail if not labeled correctly. For example, the subject line for this month's assignment should be: "Photo Assignment: May 2012." Also, if you can, please don't strip out the metadata. And feel free to add any IPTC data you wish (These fields in particular: Caption, Credit, Copyright, Byline), I use that for the caption info. Congratulations to Carl Shortt, Jr. for his Rule of Thirds image of an outdoor portrait. Carl will receive a SizzlPix for his winning image, selected by the good folks at SizzlPix. 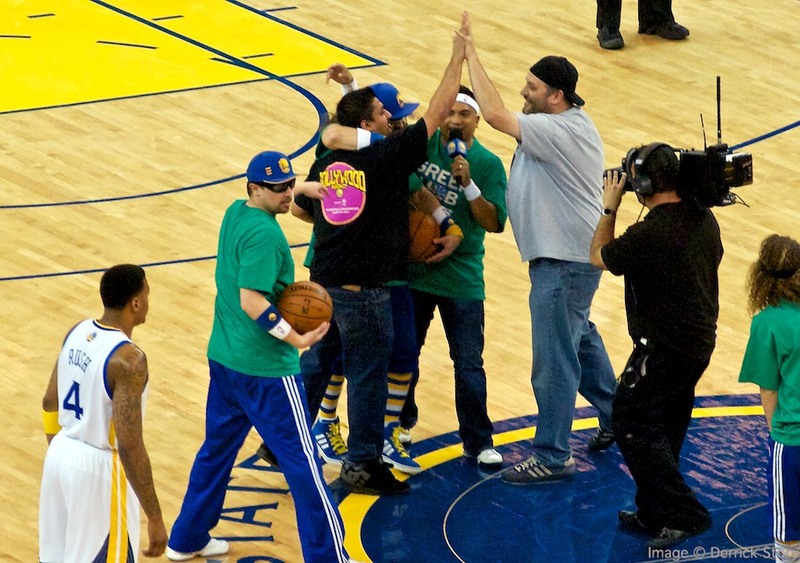 The Golden State Warriors have some of the most entertaining acts during timeouts and halftime. But the best was Saturday night when Ronak Desai, a season ticket holder from Dublin, CA, drained a half court shot to earn himself $10,000. Ronak Desai in the black T-shirt celebrating after draining a half court shot for $10 K.
Ronak actually had three shots that evening. The first, from the free throw line for $500, which he missed. The second, from the 3-point line for $2,000, which he made. And the finale, from half court for $10K. As you can see from the official Warriors video, he hit nothing but net. It was clean. I captured my shot of his celebration with an Olympus PEN E-PM1 and the Olympus 40-150mm zoom that barely got by the bag inspectors because it is right at the 3" long limit. Overall, a great night of action and entertainment. I've posted more shots from the game on my TDS Flickr page. For the Feb. 2012 Photo Assignment, TDS shooters got back to basics and worked with the Rule of Thirds for their compositions. But even within these guidelines, the shots are as unique as the shooters themselves. See for yourself in our gallery, Rule of Thirds. And which one will be the SizzlPix Pick of the Month? Photo by Brandon Doran. "For this shot I wanted to contrast the immensity of the architecture vs. the smallness of a person. It worked out that I could center 3 columns and get the scale I wanted. 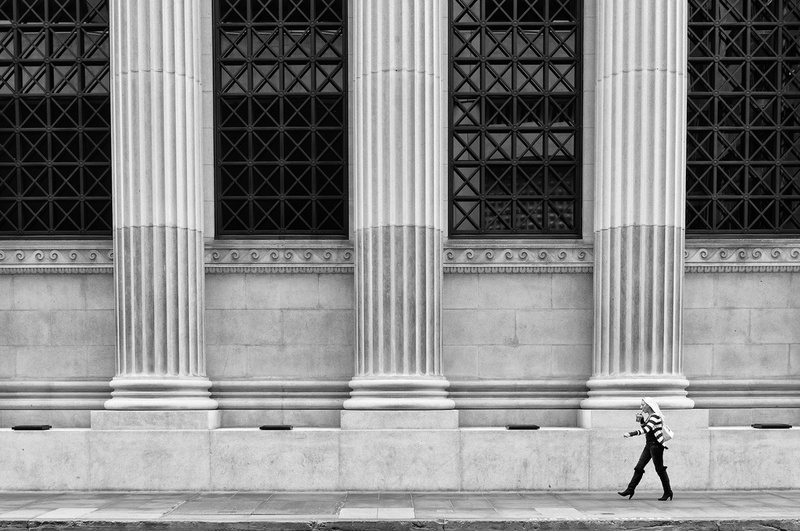 My vision was to capture a person walking directly in front of the rightmost column so that the person would be in the lower right third of the frame." To see all of the other terrific shots from Feb., visit the Rule of Thirds gallery page. The April 2012 assignment is "Macro." Details can be found on the Member Participation page. Deadline is April 30, 2012. Please follow the instructions carefully for labeling the subject line of the email for your submission. It's easy to lose these in the pile of mail if not labeled correctly. For example, the subject line for this month's assignment should be: "Photo Assignment: April 2012." Also, if you can, please don't strip out the metadata. And feel free to add any IPTC data you wish (These fields in particular: Caption, Credit, Copyright, Byline), I use that for the caption info. Good luck with your April assignment, and congratulations to all of the fine contributors for February. Congratulations to Ram Gurung for his Mobile Phone image of NY Times Square. Ram will receive a SizzlPix for his winning image, selected by the good folks at SizzlPix. For the Jan. 2012 Photo Assignment, TDS shooters put their callers on hold and snapped photos with their camera phones. You can view a wide variety of on-the-go imagry in our gallery, Mobile Phone. It's a glimpse of the world as it passes by. And which one will be the SizzlPix Pick of the Month? Photo by Bernie Anderson. "This is a building across from one of the schools I teach at. Not very welcoming, I'd say..." Bernie captured this wonderful image with his iPhone 4, then color corrected in Aperture 3. To see all of the other terrific shots from Jan., visit the Mobile Phone gallery page. The March 2012 assignment is "Eyes." Details can be found on the Member Participation page. Deadline is Mar. 30, 2012. Please follow the instructions carefully for labeling the subject line of the email for your submission. It's easy to lose these in the pile of mail if not labeled correctly. For example, the subject line for this month's assignment should be: "Photo Assignment: March 2012." Also, if you can, please don't strip out the metadata. And feel free to add any IPTC data you wish (These fields in particular: Caption, Credit, Copyright, Byline), I use that for the caption info. Congratulations to Michael DeBuhr for his image titled, Brothers. Michael will receive a SizzlPix for his winning image, selected by the good folks at SizzlPix. 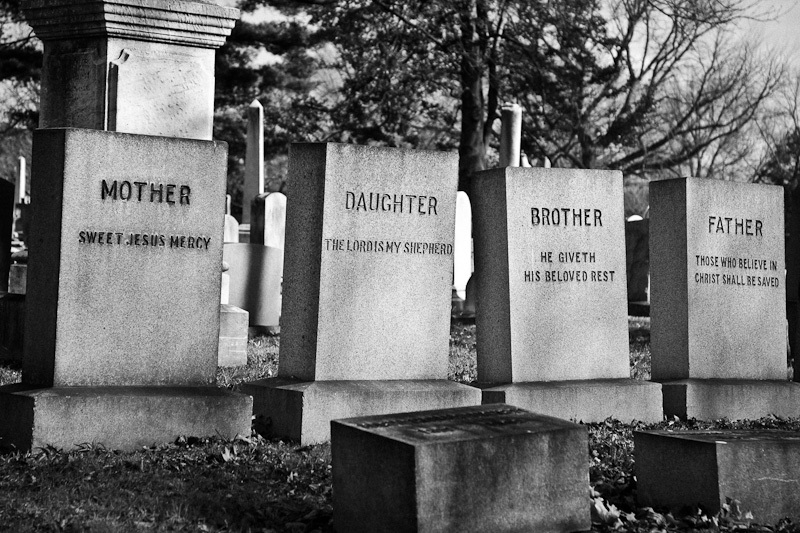 For the Dec. '11 Photo Assignment, TDS shooters looked close to home for exploring the theme Family. One of the things I enjoy most about this gallery are the captions that accompany the images. Make sure your read them as you view the pictures. And which one will be the SizzlPix Pick of the Month? Photo by Fred S. Brundick. To see all of the other terrific shots from Dec., visit the Family gallery page. The Feb. 2012 assignment is "Rule of Thirds." 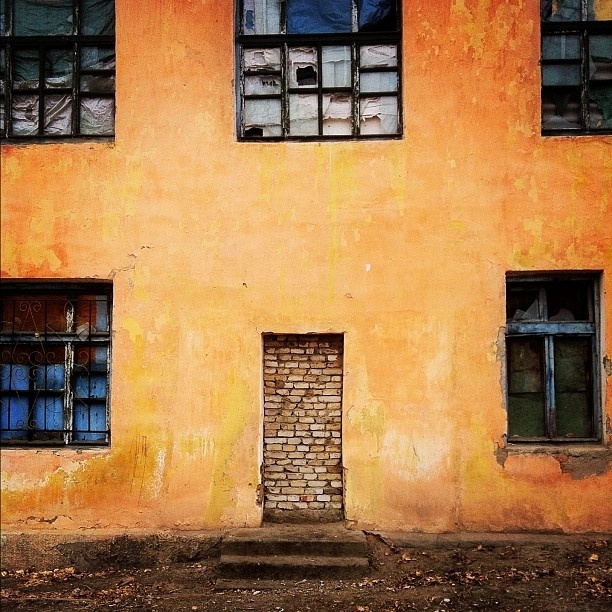 To qualify, the entry image should take advantage of the rule of thirds in its composition. Details can be found on the Member Participation page. Deadline is Feb. 29, 2012. Please follow the instructions carefully for labeling the subject line of the email for your submission. It's easy to lose these in the pile of mail if not labeled correctly. For example, the subject line for this month's assignment should be: "Photo Assignment: Feb. 2012." Also, if you can, please don't strip out the metadata. And feel free to add any IPTC data you wish (These fields in particular: Caption, Credit, Copyright, Byline), I use that for the caption info. Good luck with your Feb. assignment, and congratulations to all of the fine contributors for December.